File consists of UNBC Statement of Values. File consists of a UNBC publication entitled "Points North". File consists of a UNBC publication entitled "UNBC Ecomomics Briefing". File consists of a UNBC publication entitled "Computing and Telecommunications CTS Autobahn". File consists of a UNBC publication entitled "The Wolf". File consists of a UNBC publication entitled "The Agora the newsletter of the Northern BC Graduate Students' Society". File consists of a UNBC publication entitled "UNBC The Purchasing Newsletter". 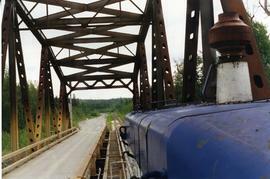 File consists of documentary photographs taken by David Davies of the Northwood Pump Mill Railway in Prince George, British Columbia. 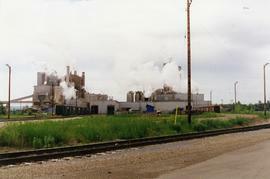 Main line of Northwood Pulp and Timber Ltd. 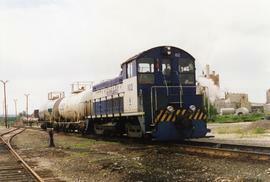 Photograph depicts a switcher running towards a CN interchange. Just left the Fraser River bridge. All private and owned by Northwood Pulp and Timber Ltd.
Embankment of Northwood Pulp and Timber Ltd. Photograph taken on a 40 ft. high embankment. Looking towards Fraser River. Northwood Pulp and Timber Ltd. in western direction. All trackage owned and built by the mill. Constructed in 1966. 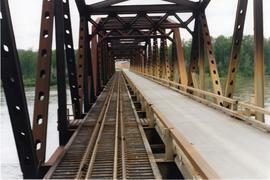 Photograph depicts a private rail/road bridge built to serve Northwood Pulp and Timber, Ltd. Crossing Fraser River. Looking west, towards the mill. On private Northwood trackage. 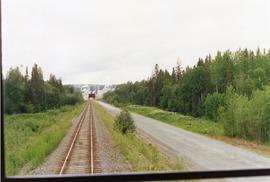 Photograph taken at the Northwood Pulp and Timber Ltd, Prince George. 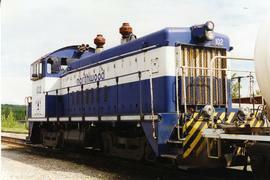 Visible is a General Motors switcher, built in 1959. Aqcuired in 1981. On private Northwood trackage with the mill in the background. Photograph depicts Northwood Pulp and Timber Ltd, Prince George. 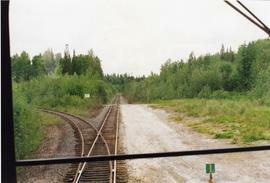 Located north of the city, near the BC Rail and CNR mainline tracks. It had its own railway of about 5 miles in length and two diesel switchers.